South Florida music lovers regard Lynn University’s Conservatory of Music as one of the area’s finest musical adornments. The Lynn Philharmonia, the student orchestra of the Conservatory, performed its fourth concert of this season Jan. 26 under the direction of the institution’s dean, Jon Robertson. The program opened with the Academic Festival Overture (Op. 80) by Johannes Brahms. Written in 1880 to acknowledge the award of an honorary degree from the University of Breslau (now Wrocław, Poland), the composer conducted the premiere at the university the following year, and the four student songs he worked into it would have been immediately recognized by both students and faculty on that occasion. It ends with the famous Gaudeamus igitur. Robertson led his student players in a shapely and excellently balanced account. Only some stopped horn notes suggested inexperience. The Adagio for Strings by Samuel Barber was originally the slow movement of his String Quartet (Op. 11), written in 1935-36 when the composer was living in Austria. This famous movement’s stepwise musical progress was accompanied by an emotional intensity that brought it great popularity, particularly after Arturo Toscanini performed a string orchestra version in 1938. It subsequently became linked with mourning and was played after the deaths of Presidents Roosevelt and Kennedy, among others. Robertson controlled its expressive compass admirably, particularly in terms of dynamics in a piece that so easily can become too much too soon. His tempo seemed quicker than the composer’s desired Molto adagio; however, he may have done so in order to ensure good ensemble. Composer Anthony DiLorenzo (b. 1967) is a trumpeter and composer. His original works include a large quantity of music for television, films, and wind and brass ensembles. 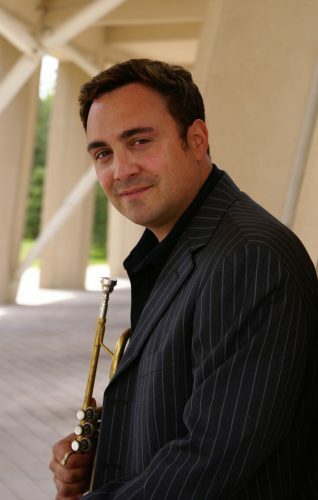 Phoenix, a concerto for horn and orchestra, was commissioned by William VerMeulen, who played the premiere with the Shepherd School Symphony Orchestra and conductor Larry Rachleff at Rice University in March 2014. The soloist on this occasion was Gregory Miller, one of Lynn’s distinguished artists-in-residence, who is also affiliated with the University of Maryland. A standard three-movement work, Phoenix opened with a rather busy horn solo. The accompanying orchestra was composed of winds and strings, and the composer’s penchant for skillful instrumentation of a highly colorful nature was forcefully established. Although the melodic material was not particularly memorable, it was exceptionally approachable. Miller’s best playing came in the finale, when he finally seemed to have warmed up, with a gratifying improvement in accuracy. He dispatched its unaccompanied cadenza brilliantly, as well as the busy solo theme of the beginning when it is recalled near the conclusion. I was unable to stay for the Beethoven Symphony No. 5 (in C minor, Op. 67) that occupied the program’s second half. However, if the quality of the Philharmonia’s playing in the first half was any indicator, both the student players and the audience would have been pleased.